"Nippy’s" adventure…, originally uploaded by EcoSnake. 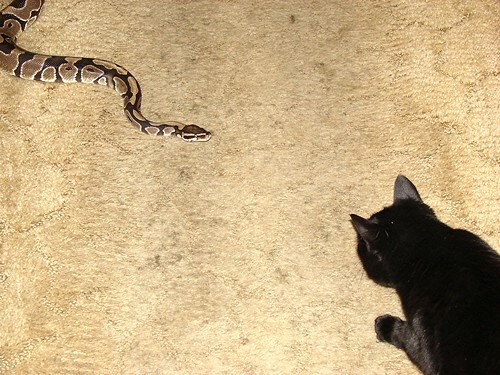 This photo was staged, though the snake (Nippy) had escaped from her enclosure and had encountered “Co-op,” the cat. I’m postng it as a way to illustrate the preceding story about the escaped Royal (ball) python in Canada. Click on the picture or link to read the whole story behind this picture.